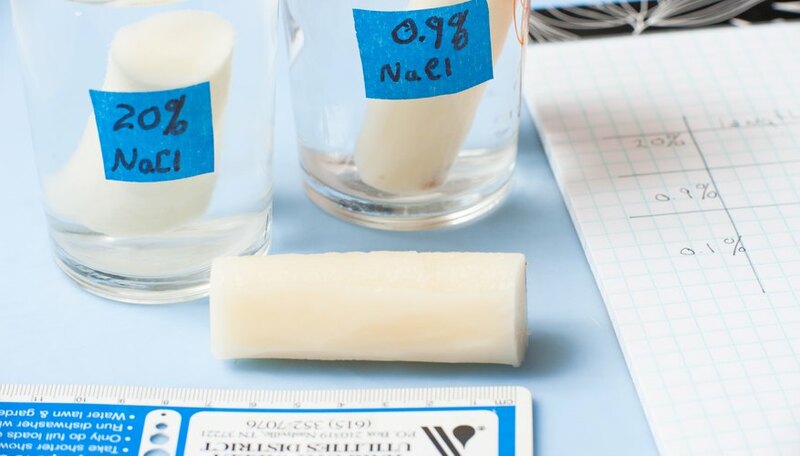 Osmosis, the process in which solvent molecules move from an area of lower solute concentration to an area of higher solute concentration, can easily be demonstrated with potato experiments. 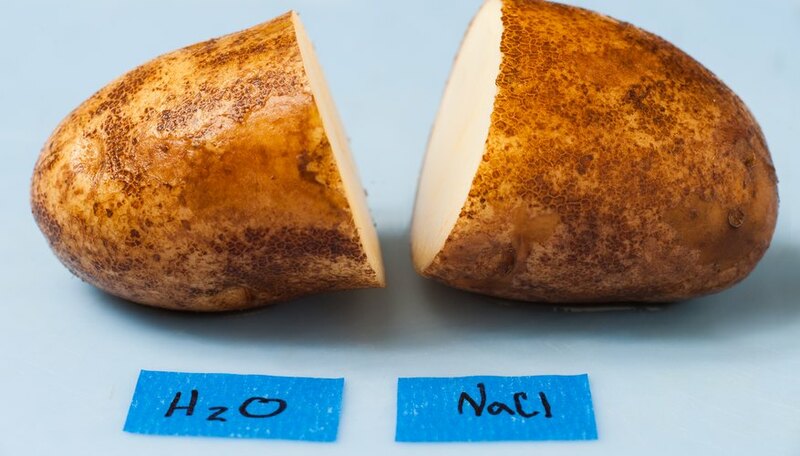 Potatoes are full of both water and starch, and will gain water when immersed in watery solutions. Conversely, they will lose water when in concentrated solutions, such as those containing a great deal of starch. 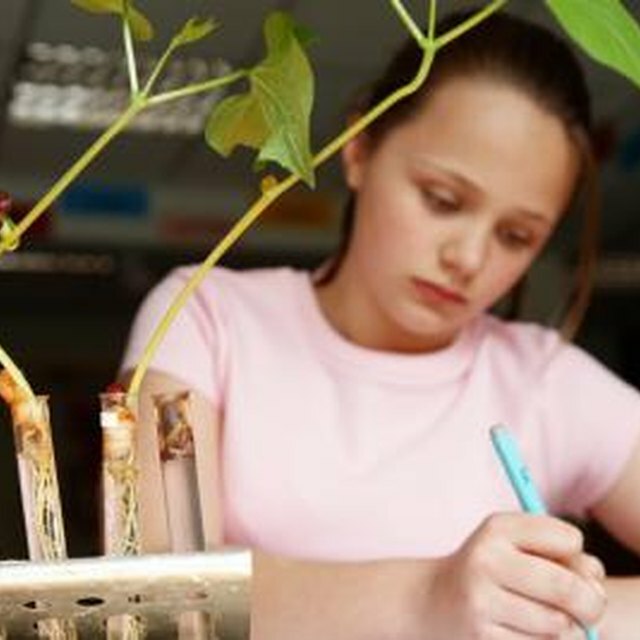 You can use potatoes to set up osmosis experiments for students of all ages and levels. 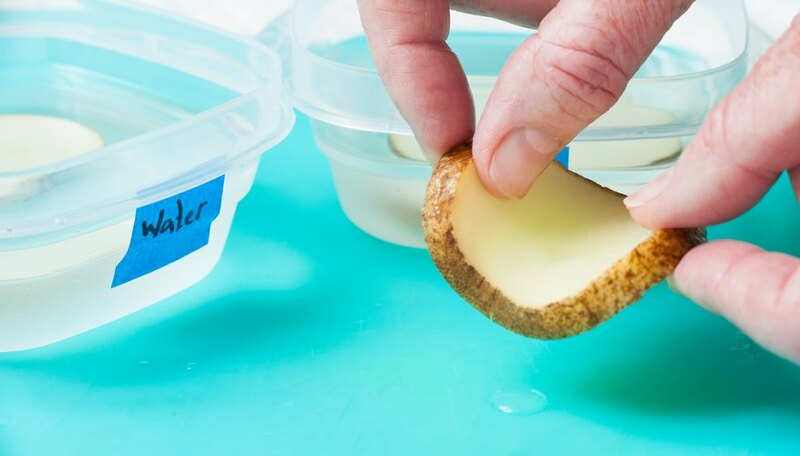 Cut a potato in two, and immerse one of the halves in a very salty solution of water — one containing a quarter cup of salt in a cup of water. Immerse the other piece in tap water containing no added salt. Leave both in their respective solutions for half an hour, then remove the potato halves from their solutions and observe their differences. The one in the salty solution will have shrunk, indicating that water is diffusing from a less concentrated solution to a more concentrated solution. The one in the tap water solution, in contrast, will actually swell slightly, indicating that it is taking in water. This experiment helps students to differentiate between different degrees of concentration gradients. Make one salt water solution, one sugar water solution, and for the third solution, simply use tap water. Make three thin potato slices — 1/2 cm thick. Place each potato slice into each of the solutions, and leave the slices in the solutions for a half hour. Observe that the slice placed in salt is very flexible, while the slice placed in sugar is flexible, but less so. Since potatoes already contain sugar, less water will diffuse out of the potato placed in sugar water. The slice placed in water will be rigid, since it will absorb water. Give your students potato "cylinders" that are uniform in length and size: for instance, you could cut them to be 70 mm in length and 7 mm in diameter. Make solutions of saline in three different concentrations, 20 percent, 0.9 percent and 0.1 percent. Have the students measure the lengths and diameters of the potato cylinders before and after soaking them in the saline solutions for half an hour. Then, have them calculate the changes in the lengths and diameters of the cylinders, and plot the saline concentrations versus the changes. 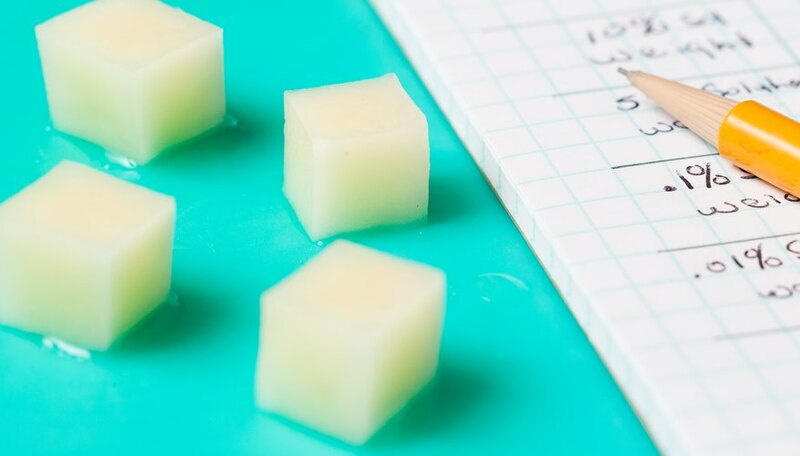 Cut potatoes into four groups of small, uniform cubes measuring 1/2 cm by 1/2 cm. Make four different solutions of sucrose: 10 percent, 5 percent, 1 percent and 0.01 percent. Weigh each group, on a mass balance, before immersing it in the appropriate sucrose solution for half an hour. After immersion, weigh each group again and have your students calculate the changes in the potato masses. Ask them to comment on why a group gained mass, lost mass or retained the same mass. Lobo, Tricia. "Science Experiments on the Osmosis of a Potato." Sciencing, https://sciencing.com/science-experiments-osmosis-potato-8360195.html. 26 April 2018.